More details via Marcel Palm on the contact form below. This very high spec Villa, totally brand new was built in 2012 using high end materials throughout. Entering into the property through the automatic gates there is parking enough for 4 cars. Entering into the outside space modern steps with aluminum hand rail lead you up to the heavy hard wood security door. The property has its own gas tanks, electricity and mains water. This really is a property to be viewed and admired. Modern living in a tranquil setting close to all the amenities that the Albir has to offer. Through the main entrance door you will find an ample sized hallway which leads you to an impressive space sectioned off to provide a dining area as well as large living area with American kitchen like no other! Great attention has been paid throughout the property to the uses of marble, granite and tiling which is most evident in the kitchen area. Modern appliances line the kitchen walls. Further rooms as well as a bathroom can also be found on this floor. These rooms are currently empty providing the new owner with a blank canvas and designation as required, office/study, games room, additional bedrooms, the choice is yours. The upper floor leads you to an impressive additional living area. There are 3 bedrooms on this floor with 2 additional very impressive bathrooms again furnished to a very high standard. 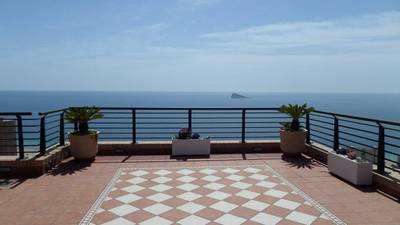 Amazing floor to ceiling glass patio doors lead out onto a further two balconies with panoramic views of Albir, the mountains and the sea. We are pleased to offer this large detached 4 bed, 4 bath villa set in its own grounds with lovely gardens, private pool, upper sun terrace, garage and granny annex. 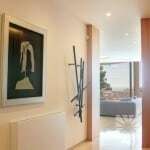 Set in the centre of Albir but in a quiet residential area in walking distance of shops, bars, restaurants and the beach. 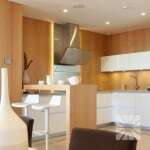 The interior has been designed to a high standard and very tastefully decorated. The main large living area is set out to a lounge section and a dining section. Leading off of the lounge is a separate fully fitted kitchen with plenty of storage units, and all modern day appliances. The kitchen door as well as the lounge patio doors lead out to the garden area providing plenty of natural light to enter into the property. The property is all on one level and all of the bedrooms are double sized and en suite with very plush bathrooms, some with baths and some with walk in showers. Again these rooms have been finished to a very good standard with modern tiles and furnishings. The outside areas of this property are laid out to sections and has been designed to be low maintenance. There is a bar area ideal for summer dining and parties as well as a putting green for the big and small kids! Steps to the side of the property lead up to a good sized sun terrace. There is a private swimming pool with terraces ideal for relaxing on. The garden has mature shrubs and trees and various sections with additional garden features. There is a one car garage and also a 1 bed granny annex complete with Spanish style BBQ and separate toilet. The property is fully fenced and is extremely private. 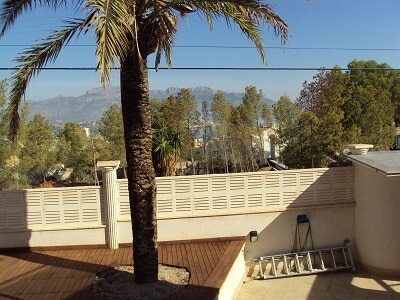 Although in the centre of Albir, the property benefits from being in a quiet road. The Villa is south facing with mountain views. This is a lovely property and really should be viewed to take in all of the features it has to offer. Ideal as a family home for permanent living as well as a holiday home. 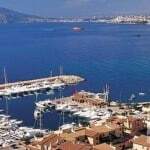 Albir is a very popular area with all European nationalities. A very cosmopolitan area containing bars, restaurants and shops. All levels of schools are available both private and state. A 55 minute drive from Alicante airport. 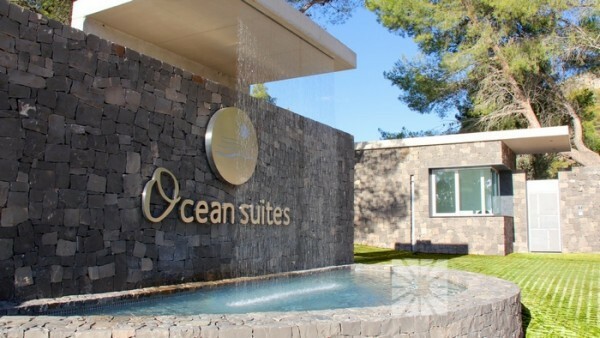 One company that has specialised for many years in this luxury property is First 4 Property Group who are based on the Costa del Sol but who cover the whole of Spain. In fact, as of today’s date they have access to some 50,000 properties throughout the mainland, the Canaries and the Balearic Islands.A large percentage of these are what can be called “luxury.” Indeed, as of today, I counted almost 1,000 properties at one million euros or more. Quiet a choice!